On a theoretical level, popular music records serve as artefacts of the social and cultural networks in which their particular performers are embedded. Seen from this perspective, the appearance of the earliest Afrikaans gramophone records coincided with a crucial juncture in the formation of Afrikaner identity, as well as the development of the language itself. This article is a forensic investigation into the socio-political contexts in which the first Afrikaans gramophone records were produced. Its sources include updated discographic catalogues that have led to the discovery of listings of a number of recordings that pre-date the previously earliest known Africana and Afrikaans records. Most of the first Africana recordings were of the national anthems of the two Boer republics during and shortly after the Anglo-Boer War (1899-1902) and sung by Dutch singers. The first Afrikaans recordings by people beginning to define themselves as Afrikaners, date back to 1906, while local advertisements for Afrikaans records began to appear in 1910. This article will seek to explore the link between these recordings and claims for nationhood based on the linguistic identity of a key group of white Afrikaans speakers. Key words: Afrikaans; Africana; gramophone records; identity; national anthems. Op 'n teoretiese vlak funksioneer populêre musiek albums as artefakte van die sosiale en kulturele netwerke waaraan die kunstenaars gekoppel is. Gesien van uit hierdie perspektief, val die eerste Afrikaanse gramofoon plate saam met 'n belangrike stadium in die ontwikkeling van Afrikaner identiteite, asook die ontwikkeling van Afrikaans as taal. Hierdie artikel is 'n forensiese ondersoek wat fokus op die sosio-politieke kontekste waarin die eerste Afrikaanse gramofoon plate gemaak is. Bronne sluit in opgedateerde diskografiese katalogusse wat gelei het tot die ontdekking van lyste van opnames wat ouer is as die vroegste bekendste Africana en Afrikaanse plate. Die meeste van die eerste Africana opnames was van die nasionale volksliedere van die twee Boere republieke tydens, en kort na, die Anglo-Boereoorlog (1899-1902) en is gesing deur Hollandse sangers. Die eerste Afrikaanse opnames deur mense wat begin het omhulself te definieer as Afrikaners dateer uit 1906, terwyl plaaslike advertensies vir Afrikaanse plate begin verskyn in 1910. Hierdie artikel beoog om die verhouding tussen hierdie opnames en eise tot nasieskap, gebaseer op die linguistiese identiteit van 'n sleutelgroep Afrikaners, te verken. Sleutelwoorde: Afrikaans; Africana; gramofoon plate; identiteit; nasionale volksliedere. No official archive exists of the earliest Afrikaans music recordings and written sources are very limited. The Suid-Afrikaanse Musiek Ensiklopedie (South African Music Encyclopaedia, hereafter SAME),14is the most comprehensive and provides a detailed discography of early Africana and Afrikaans records between 1901 and 1938. One of the SAME's main sources is Roberto Bauer's The New Catalogue of Historical Records, 1898-1908/09.15New information surfaces regularly, which means that such catalogues become outdated.16 More recently, the discographer Alan Kelly's research on the Gramophone Concert Company has provided invaluable information of the earliest years of the global recording industry.17 Since this company, along with its subsidiary labels HMV and Zonophone, was responsible for most of the earliest Afrikaans recordings, Kelly's catalogues are of major significance. It can be searched online at the AHRC Research Centre for the History and Analysis of Recorded Music (CHARM) in the UK, established in 2004. The CHARM discography was especially useful in finding listings of early Afrikaans recordings in London that are older than those of Paul Roos' Springbok rugby team (from 1906), which were previously thought to be the first in Afrikaans, by Afrikaners.18 The Truesound Online Discography Project19 is another online archive with almost 400 000 matrix listings of early recordings. Here, the Zonopoint catalogue (again thanks to Kelly and updated in 2003) yielded matrix listings of a number of Afrikaner national anthems never before documented that pre-date the earliest mentioned in the SAME (Thomas Denijs' and Betsy Schot's recordings of 1901). Unfortunately, such catalogues are not organised according to language or title, which forces the researcher to go through hundreds of thousands of matrix listings with potentially very low yields.20 Another valuable source, especially for information on the 1912 South African recordings and later, is the South African Audio Archive, which features photographs and sound clips of old records sourced from private collectors.21 By consulting these various updated catalogues for previously unknown recordings and combining it with the existing information listed in the SAME, a more complete picture has emerged on early Afrikaans records. These new discoveries provide a unique opportunity - and a larger sample size - to explore the relation between recorded Afrikaans music and emerging Afrikaner identities at a critical phase of the development of Afrikaner nationalism. In the absence of the actual recordings, it is impossible to establish definitely whether the early recordings of Transvaalsch Volkslied are indeed Van Rees' version, or one of the other anthems also known as the Transvaalsch Volkslied, or if some recorded the former, while the other recorded the latter, which would mean that they are in fact Afrikaans and not Dutch, and will have an even more direct link to early Afrikaner nationalist ideals. Despite the fact that there exists confusion over the titles of some of the anthems, the fact that many were penned by people closely connected with the first Taalgenootskap, adds real political significance.56 Furthermore, a number of these anthems were later invoked during a new wave of Afrikaner nationalism when they were published in the first Federasie van Afrikaanse Kultuurvereniginge (FAK) songbook in 1937. These early records were not, in a strict sense, popular music recordings and it is doubtful whether they were even on sale in South Africa. They were also -depending on which version of the Transvaal Volkslied - probably in Dutch, not Afrikaans. The earliest undisputed recordings by Afrikaans-speakers in Afrikaans date to 1906 and were made in London. On 9 July a J.F. Smith recorded Transvaal Dialogue; Transvaal Volkslied; The Vine: Transvaal Recitation; Boer Melodies; Transvaal Volks: Paraphrase. J.F. Smith was likely actually J.J. Smith - as initials were often noted down incorrectly either by studio engineers or later discographers who had to decipher handwritten documents. There is evidence that J.J. Smith's initials were occasionally changed to "J.D." on later record listings.57 Smith recorded several Afrikaans dialogues in the following years in London and was in correspondence with the Gramophone Record Company on copyright issues regarding Afrikaans recordings of English hymns.58 Judging by his personal letters to his mother, he did not share the same anti-imperialist notions of many Afrikaners of his time. He preferred the English to the Dutch, and was at first a strong supporter of Louis Botha. This changed in the aftermath of Union, when his allegiance switched to Hertzog.59 Upon returning to South Africa after his studies in London, he became the editor of Die Huisgenoot in 1916. He also became the first ever professor in Afrikaans, at Stellenbosch University in 1919, where he happened to lecture a young Hendrik Verwoerd. Smith was also the first editor of the Woordeboek vir die AfrikaanseTaal (WAT).60 He was an important figure in the Second Language Movement. Die Brandwag was launched in 1910 by the Afrikaanse Taalgenootskap (Afrikaans Language Society) as an important vehicle for language mobilisation in the wake of Union.68 Hofmeyr's perceptive analysis of the development of Afrikaans literary culture and its role in elaborating Afrikaner nationalist ideology brings into focus the way in which publications like Die Brandwag and Huisgenoot re-packaged all manner of everyday things as "Afrikaans".69 Advertisements like the one above, as well as the records advertised, formed part of this process of defining Afrikaner identity. Answering a public call for information on Visser's life, State President C.R. Swart himself responded with a letter in which he revealed a number of facts attesting to her close connection to the Afrikaner political elite of the early twentieth century. Visser apparently enjoyed a close relationship with the Hertzogs and often spent time at their home. 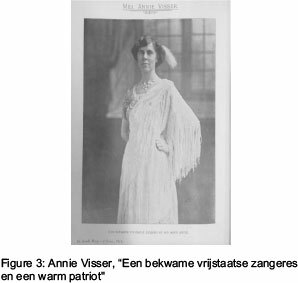 She also sang at the inaugural congress of Hertzog's National Party in 1915, and was given the honour of choosing the colours of the new party (orange and white).82 Although Stegmann's accounts of Visser's patriotism date to the height of Afrikaner nationalist optimism, her proximity to Afrikaner nationalism of the early decades of the twentieth century is important. Also significant is that she features prominently as one of the earliest singers of popular Afrikaans songs on gramophone record. 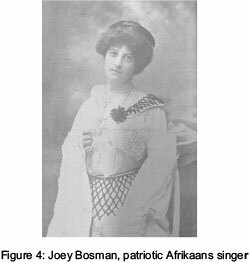 Another seemingly patriotic Afrikaans singer was Joey Bosman, who, like Visser, received classical vocal training in England, possibly during the Anglo-Boer War. According to a July 1903 article in De Goede Hoop, Bosman once, during her three year stay there, responded to anti-Boer comments by calmly pinning a ribbon of the Vierkleur (the flag of the defeated Transvaal republic) to her chest.83 Apart from this article, no other references to Bosman could be found nor any indication that she recorded any music, since she returned to South Africa well before the first Afrikaans recordings. 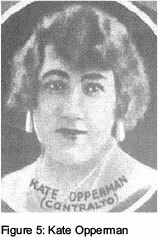 Kate Opperman recorded several songs including Het Volkslied van de Zuid-Afrikaanse Republiek, Het lied der Afrikaners and Volkslied van de Oranje-Vrystaat in London c. 1912-1913.87 Originally from Ladybrandt in the Free State, she won a scholarship and left for London in 1911. She apparently performed at the Albert Hall, the Queen's Hall and at Sunday League Concerts at the London Palladium during this time.88 More nationalist sentiment can be found in another early Mackay Brothers advertisement for an Afrikaans record of a c. 1910 London recording of the Treurmarsch, a funeral march for Paul Kruger to the music of the Transvaalsche Volkslied by the British group The Black Diamonds89 (although their name does not appear on the advertisement).90 It was priced at two shillings and sixpence. The Peerless Orkes' Vat jou Goed en Trek Ferreira/ Tikkiedraai -Selections of Popular Afrikander Songs and Airs of 1909-1910 were also among the earliest Afrikaans music recordings.96 All these recordings feature a mixture of Afrikaner national anthems, hymns and spirituals, Afrikaans dialogues and popular, light songs. Because they were recorded overseas, the accompanists were seldom South African, let alone Afrikaners. In South Africa, informal popular music performances, especially dance music, were often carried out by coloured musicians,97 but were not recorded. Furthermore, if one considers the sensation the first gramophone records caused in South Africa, with people flocking to public record concerts held nationwide,98 it had to be a profound experience for Afrikaners. Not only did this new technology amaze listeners, but to be able to listen to Afrikaans music - like the anthem of the old Transvaal Republic - sung by sympathetic European singers, or the Springboks singing in Afrikaans while the trauma of the war was still raw, must have stirred up strong emotions. Pretorius mentions that Boer commandos were occasionally entertained in the field by music boxes looted from the British or from abandoned farmsteads (in one instance they came across a music box that only played three German songs),99 although it is unlikely that they ever listened to Africana records during the war. Among the others were recordings of Afrikaans stories, notably by poet Melt J. Brink's own works, like Mijn Land, mijn Volk, en Taal, and Die Vrome meid, Deel 1/ Deel 2, as well as Afrikaan Talking.103 Brink was well-known local poet, as well as a prolific playwright, known for his humorous pieces.104 Singer P.J. du Toit recorded N' Dronk Liedjie van n Mozambique en N Jolly Hotnot in Johannesburg in 1912.105 This song has an overtly racial connotation: a '"Mozambique" in such a context is a reference to an imported slave (see also the quote above), and "Hotnot" a derogatory term referring to a coloured person. The comic Willem Versfeld featured prominently and made at least 26 recordings, including the humorous Bantu song Sakobong Songki.106Although the themes varied substantially between "a blend of spoken word, humorous monologues, Afrikaans folk songs and other somewhat bawdy and also racist tunes",107 they bear witness to the Afrikaner's weltanschauung at the time. Also noteworthy is that there are very few recordings of Afrikaner national anthems among these. On the other hand, the Carnegie Report showed that poor Afrikaners found access to gramophone players: "Immediately they start living in luxury; instead of saving, they buy a number of things they do not need, such as a gramophone or a piano. "112 This statement is the only reference to musical activities among poor whites in the 1932 report. Musical instruments and gramophone players were associated with the "improvident carefree life" of poor whites: living lavishly when they had money, and depending on charity when not.113 Along with other social ills like crime, unemployment and a lack of education, to which they were exposed, it indicated a maladjustment to the economic decline of alarmingly high numbers of poor whites. Unfortunately it is impossible to determine exactly how many poor Afrikaners owned gramophone players before the First World War, although the number of Afrikaans recordings and advertisements hints at some demand. 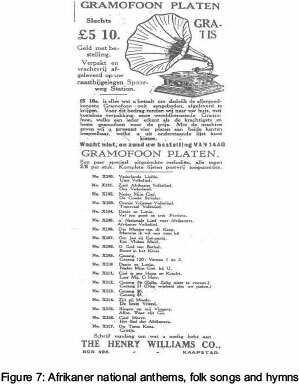 Figure 7 below, a 1916 advertisement for gramophone records (many of which were probably recorded in London before 1912) shows three main themes: nationalism, folk songs and spirituals. Various nationalist anthems were recorded, like Vaderlands Liefde, Unie Volkslied, Zuid-Afrikaanse Volkslied, Oranje-Vrijstaat Volkslied, Transvaal Volkslied, and Afrikaner Volkslied. Popular folk songs were Mamma ik wil Een Man hê, Ou Tante Koos, and Grietjie.114 These recordings were significant since on the one hand, they played on the nostalgia associated with the independence of the old Free State and Transvaal Republics, and on the other appealed to a separate political identity for Afrikaners inside the Union. They also carried extra significance in the wake of the 1914 Rebellion, when many Afrikaners sought independence for the Union from Britain. 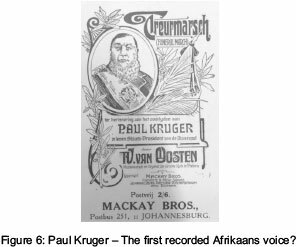 Furthermore, the prominence of Kruger in early recordings (like the Treurmarsch), signifies his prominence as Afrikaner leader. Apart from nationalism, this much larger sample of recordings (including those of the following decades) contain codes of racial dominance, language aspirations, anti-imperialism and religion - all themes that were later invoked during the 1930s and the rise of a more "virulent"115 form of Afrikaner nationalism. The development the South African recording industry was interrupted by the outbreak of the First World War in 1914, when it became too difficult to send the recordings back to England for pressing and then back again to South Africa as the finished product. It only resumed in 1924, when the Edison-Bell Company sent a recording studio to Cape Town, where 50 double-sided albums were recorded using new acoustic technology. Of these recordings, only eleven were in Afrikaans, and were mostly light operatic singers and church choirs.116 The following year saw an increase in the number of local recordings - still mostly in English - with the introduction of electric recording technology. Most of these new recordings were done for the HMV Company.117 The material differed somewhat from the earlier recordings in that national anthems and folk tunes did not feature so prominently. By this time, of course, the Afrikaner political landscape had changed notably. Hertzog's National Party came to power in 1924 and Afrikaans was recognised as one of the two official languages of the Union in 1925. However, the language issue persisted in many ways while the issue of poor Afrikaners remained paramount. Whereas during the first two decades of the twentieth century, poor white-ism was regarded as the result of inherent weakness, attitudes changed after the Carnegie Commission's report. The social upheaval caused by the Great Depression in the early 1930s, exacerbated by the great drought of 1932-33, were especially hard felt by Afrikaners. Despite these conditions, this era saw a marked increase in the number of Afrikaans music recordings, including vastly popular boeremusiek albums, which underscored clear heterogeneous elements of class and political affinity that fall outside the direct scope of this article. The complexity of Afrikaans music performance, as well as its diversity, is under-represented in early popular Afrikaans music records. This not only bears some testament to the racial politics intimately involved in the development of the Afrikaans language as well as popular Afrikaans music, but also of the contingent nature of these developments. What does appear to be a salient feature in early Afrikaans gramophone records is the close relationship between one emerging section of white Afrikaans speakers and their claims for nationhood in the early twentieth century._The trauma of the Anglo-Boer War and its immediate aftermath determined the socio-political context of these recordings of which the earliest were sung not by Afrikaners, but by sympathetic singers in continental Europe. The recordings of various Afrikaner national anthems in London by patriotic Afrikaans singers around the time of Union, and the subsequent advertisements in Die Brandwag, coincided with a rapidly changing cultural landscape. Although few anthems were recorded in South Africa in 1912, the wider range of themes still reflected a growing Afrikaans cultural industry with strong links to Afrikaner nationalism, although the political content of these records should not be overstated. Advertisements for recorded Afrikaner anthems dated to 1916 do suggest some level of nostalgia to a politically independent past. 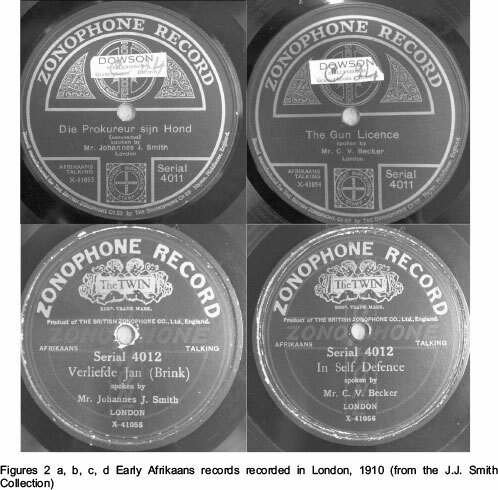 Ultimately, one cannot claim that all pre-WW1 Afrikaans and Africana gramophone records represented an acute self-awareness of a developing linguistic identity and political self-determination, but they were nonetheless part of a growing number of cultural products at a particularly sensitive stage in the development of Afrikaner identities. 4. Constant-Martin, Sounding the Cape, p 55. 7. Stell, Luffin and Rakiep, "Religious and Secular Cape Malay Afrikaans Literary Varieties", p 289. 10. Constant-Martin, Sounding the Cape, pp 69-92. 16. Electronic communication with Alan Kelly, 29 October 2014. 17. The Alan Kelly Matrix Listings, available at http://www.normanfield.com/kelly.htm, accessed 19 June 2014. See also A. 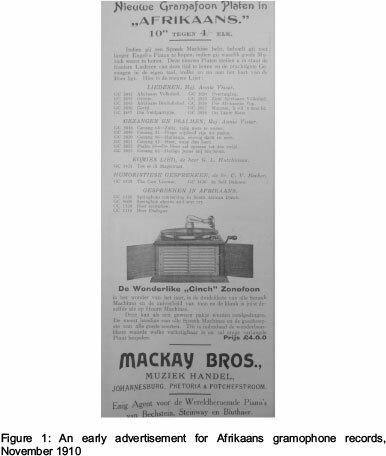 **Kelly, "Structure of the Gramophone Company and its Output, HMV and ZONOPHONE, 1898-1954", September 2000, p 3, available at The Truesound Online DiscographyProject,http://www.truesoundtransfers.de/disco.htm, accessed 18 July 2014. 18. Alan Kelly Catalogue, available at http://charm.rhul.ac.uk/index.html, accessed 5 October 2014. 19. Available at http://www.truesoundtransfers.de/disco.htm, accessed 18 July 2014. 20. For example, the author's search of almost 100 000 titles yielded just 15. 21. Available at http://www.flatinternational.org/templatevolume.php?volumeid=280, accessed 12 June 2014. 23. Invented by Thomas Edison in 1877. 25. Kelly, "Structure of the Gramophone Company and its Output", p 3. 26. Kelly, "Structure of the Gramophone Company and its Output", p 3. 27. This is as far as can be ascertained by consulting various matrix listings. It is possible that there might be more, since the listings are not complete. 29. R. Trewhela, Song Safari (Limelight Press, Johannesburg, 1980), p 26. [ Links ] See also Bouws, "Nederlandse Komponiste en die Afrikaanse Lied", p 25. 30. Trewhela, Song Safari, p 26. 32. Alan Kelly Catalogue, available at http://charm.rhul.ac.uk/index.html, accessed 5 October 2014. 33. Alan Kelly Catalogue, http://charm.rhul.ac.uk/index.html, accessed 5 October 2014. 34. Alan Kelly Catalogue, http://charm.rhul.ac.uk/index.html, accessed 5 October 2014. 35. Malan (ed. ), Die Suid-Afrikaanse Musiek Ensiklopedie, Volume 1, p 405. See also Truesound Online Discography, available at http://www.truesoundtransfers.de/disco.htm, accessed 18 July 2014. 36. Alan Kelly Catalogue, http://charm.rhul.ac.uk/index.html, accessed 5 October 2014. 37. E. Blom (ed. ), Grove's Dictionary of Music and Musicians, Volume 11 (Macmillan, London, 1954), p 665. 38. http://www.truesoundtransfers.de/disco.htm, accessed 18 July 2014. 39. Bouws, "Nederlandse Komponiste en die Afrikaanse Lied", p 25. 40. Malan (ed. ), Die Suid-Afrikaanse Musiek Ensiklopedie, Volume 1, p 350. 41. http://www.truesoundtransfers.de/disco.htm, accessed 18 July 2014. 42. http://www.truesoundtransfers.de/disco.htm, accessed 18 July 2014. 43. Bauer, The New Catalogue of Historical Records, p 425. 45. Neerlandia, 25 (Dordrecht, Geuze & Co, 1921), available at http://www.dbnl.org/tekst/nee, accessed 16 July 2014. 46. Van Wyk, "Afrikaans Language, Literature and Identity", p 80. 47. Van Wyk, "Afrikaans Language, Literature and Identity", p 80. 48. Van Wyk, "Afrikaans Language, Literature and Identity", p 80. 49. De Afrikaanse Patriot, 1, 1, 15 January 1876, pp 1-1. 50. S.C.H. Rautenbach, "Die Kerksang as Agtergrond van die Poësie uit die EersteTydperk", Tydskrif vir Volkskunde en Volkstaal, 3, 1946, p 87. 51. Bouws, "Nederlandse Komponiste en die Afrikaanse Lied", p 106. 52. N.H. Theunissen,"Ons Volksliedjies", Die Brandwag, 7 October 1938, p 17. 53. Rautenbach, "Die Kerksang as Agtergrond van die Poësie uit die Eerste Tydperk", pp 85-87. 54. Rautenbach, "Die Kerksang as Agtergrond van die Poësie uit die Eerste Tydperk", pp 86-87. See also Theunissen, "Ons Volksliedjies", p 17. 55. http://www.vetseun.co.za/anarkans/nav/toonsetverwerkkomposeer.htm, accessed 6 August 2014. 56. For further discussion on the link between national anthems and political and military conflict, see Ludemann, "Buren-Marsch", p 58. 57. Alan Kelly Catalogue, http://charm.rhul.ac.uk/index.html, accessed 5 October 2014. 58. University of Stellenbosch (hereafter US) Documentation Centre, J.J. Smith Collection, PV 333.K.G. 14. The letter refers specifically to the gezange recorded by Annie Visser. 59. US Documentation Centre, J.J. Smith Collection, PV 333.K.F.1 (86), (88), (98). 63. A. Pakendorf, "Afrikaans Music History" at http://myfundi.co.za/e/Afrikaansmusic:History, accessed 28 August 2011. See also Malan (ed. ), Die Suid-Afrikaanse Musiek Ensiklopedie, Volume 1, p 350. 64. This was the local distributor for HMV and Zonophone and one of the first companies to sell records in South Africa. 65. Die Brandwag, 15 November 1910, p ii. 66. If you have a gramophone player, you no longer have to buy English records if you want to listen to good music. These new records will enable you to listen to the finest songs and the most beautiful hymns of today in one's own language, so close to the heart of the Boer. 67. G, Preller, "Laa't Ons Toch Ernst Wezen", quoted in Hofmeyr, 'Building a Nation from Words", p 104. 68. Hofmeyr, "Building a Nation from Words", p 106. 69. Hofmeyr, "Building a Nation from Words", p 111. 70. Afrikaans Volkslied and Zuid Afrikaans Volkslied. 71. Die Brandwag, 15 November 1910. 72. US Documentation Centre, J.J. Smith Collection, PV 333.Pe.2 (7). 73. Trewhela, Song Safari, p 35. 74. Malan (ed. ), Die Suid-Afrikaanse Musiek Ensiklopedie, Volume 1, p 357. 76. F. Stegmann, "Baanbreker van die Afrikaanse Lied", Die Huisgenoot, 15 March 1963, p 61. 77. The South African Audio Archive, available at http://www.flatinternational.org/search.php, accessed 20 June 2014. 78. Malan (ed. ), Die Suid-Afrikaanse Musiek Ensiklopedie, Volume 1, p 383. 81. Stegmann, "Baanbreker van die Afrikaanse Lied", pp 9, 61. 83. De Goede Hoop, July 1903, p 146. 86. Hofmeyr, 'Building a Nation from Words", p 109. 88. Malan, (ed. ), Die Suid-Afrikaanse Musiek Ensiklopedie, Volume 3 (Oxford University Press, Cape Town, 1986) pp 353-356. [ Links ] See also http://saoperasingers.homestead.com/Kate_Opperman.html, accessed 28 November 2014. 90. Die Brandwag,15 June 1912, p. iv. 93. Song titles were often spelt differently in a different release. This was spelt Toe sê di magistraat. See also the variations of spelling of the Transvaal anthem mentioned earlier. 95. The British Journal of Nursing, 11 January 1913, p 36. 96. Malan (ed. ), Die Suid-Afrikaanse Musiek Ensiklopedie, Volume 1, p 377. With regard to these early London recordings, the SAMEs discography provides detailed listings that need not be reproduced here. 97. For a detailed discussion on racial identities in the development of popular Afrikaans music, see Froneman, "Pleasure beyond the Call of Duty", pp 49-76. 98. Malan (ed. ), Die Suid-Afrikaanse Musiek Ensiklopedie, Volume 1, p 354. 100. L. Meintjies, Sound of Africa! Making Music Zulu (Duke University Press, London, 2003), p 275. [ Links ] See also http://www.flatinternational.org/template_volume.php?volume_id=280, accessed 12 June 2014. 104. US Document Centre, Melt J. Brink Collection, MS 9. 106. http://www.flatinternational.org/templatevolume.php?volume_id=280, accessed 12 June 2014. 107. http://www.flatinternational.org/templatevolume.php?volume_id=280, accessed 12 June 2014. 108. Die Brandwag, 1 November 1912, p xv. See also Trewhela, Song Safari, p 44. 109. Die Brandwag, 15 December 1912, p xiv and p xcvii. 113. Albertyn, The Poor White Problem in South Africa: Part 5, p 42.